It's all in the subtle details. I've found that many of my outfits have incorporated relatively basic pieces with focus on texture. Pieces like these allow for frequent wear without losing my personal style. 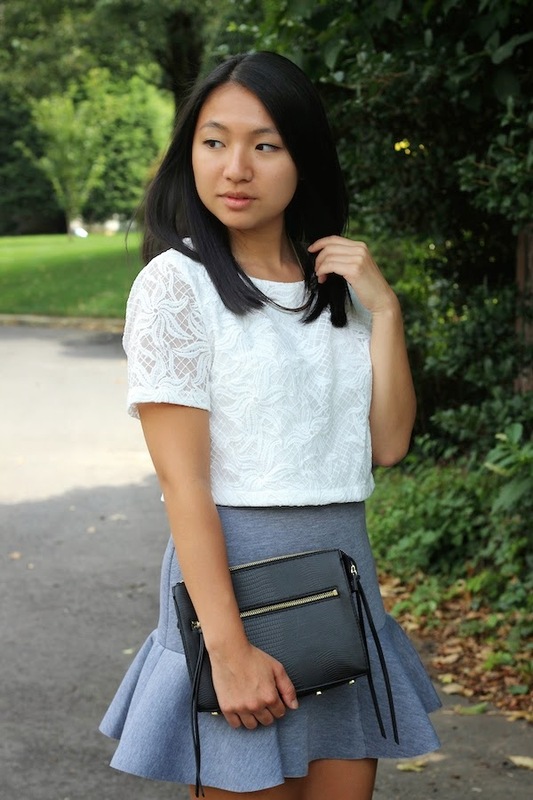 In this case, I've paired an allover lace top with a heather grey fluted skirt. The pieces together create a comfortable outfit suitable for work or school, while creating an interesting mix of texture. White and grey aren't so basic after all, am I right? P.S. I apologize if my posts have been a bit infrequent! With school starting, I will try sticking with a blog schedule in order to better organize my time. I'm thinking about committing to specific days of the week (probably 2-3)? Any thoughts? Let me know in the comments below! white and grey are very popular match nowadays! perfect combo anyway and love your sandal heels! You're so sweet, Claire! Thank you!! Aw thank you Diane!! Your style is perfect though! omg yes!!! yes yes!!! this is so on point!!! i want that skirt in my closet!!! love neutral colours on you! Awww you look lovely :) love the skirt..